Senior politicians from Ireland and the UK are attending a meeting of the British-Irish Council on the Isle of Man later. The council was set up as part of the Good Friday Agreement, which signalled an end to 30 years of the Troubles. It includes representatives of the British and Irish governments, the UK devolved governments as well as Guernsey, Jersey and the Isle of Man. Brexit is set to be high on the agenda at the meeting. The council's remit includes ways to improve cooperation between its members in areas such as the environment, lesser-used languages, transport, energy and housing. 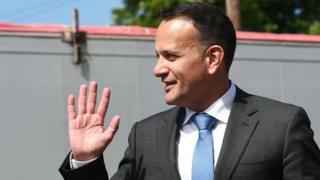 Taoiseach (Irish prime minister) Leo Varadkar, Theresa May's top minister David Lidington, Northern Ireland Secretary Karen Bradley and the leaders of the Scottish and Welsh assembles will be among those attending Friday's BIC meeting. Mr Lidington and Mrs Bradley were in Dublin last Friday for a meeting of the British-Irish Intergovernmental Conference and held talks on the absence of devolution in Northern Ireland as well as Brexit. The Northern Ireland parties will be absent from the meeting after Stormont's power-sharing government collapsed in January 2017. The main theme for the summit is meant to be digital inclusion, but it is expected that Brexit will feature prominently in Friday's discussions. It will be the fourth time that the BIC has met on the island. In the most recent BIC meeting, in Guernsey in June, Mr Varadkar said EU governments would be stepping up preparations for all possible scenarios, including a no-deal Brexit. Friday's meeting comes on a week of heightened speculation about an impending Brexit agreement. Foreign Secretary Jeremy Hunt said on Thursday he was confident of getting an eventual deal on the UK's departure from the EU through parliament. However, the Irish foreign minister, Simon Coveney, said people should not "get carried away" by rumours regarding a potential agreement. Both sides agreed to put in place a "backstop", also referred to as an insurance policy, that would only be triggered if a future trade deal is not in place by the end of 2020 - or if this final deal does not ensure a "frictionless" border. One option for the backstop is for the whole of the UK to remain temporarily aligned to the EU's customs union, avoiding the need for customs checks at the border.